Wikipedia has become one of the most commonly accessed web page for information. As 90% of Wikipedia editors are males,* it is not surprising that many notable women and non-white scientists are lacking Wikipedia pages. Furthermore, many existing pages for women scientists are obsolete, lacking relevant information about their work, or providing scarce information. In fact, Wikipedia pages for women tend to emphasize their personal lives as opposed to scientific achievements. This problem may seem trivial to many. However, a lack of visibility for women in science leads to fewer citations, lower recognition within the field and from the media, less opportunities to participate in panels or committees, less invitations as reviewers, as speakers in conferences … The list goes on. The impact that this lack of visibility has on female scientists is real. But, if nobody knows about these women, who will write a Wikipedia page about them? Thus a cycle of underrepresentation continues. There are several ways we can contribute to break this conundrum. One of them is to help make the internet a more inclusive space. 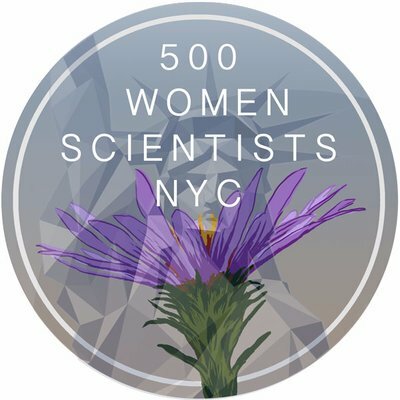 Continuing with our mission of giving female scientists the recognition they deserve, 500 Women Scientists NYC hosted a Wikipedia edit-a thon at CAVEAT on Saturday November 17, led by the incomparable Drs. Maryam Zaringhalam and Jess Wade. Dr. Wade is well-known for being a British physicist and for having edited more than 400 Wikipedia pages for women scientists, one page a day. Dr. Zaringhalam is a biologist, science writer, and one of the founders of 500 Women Scientists NYC. Together, they guided and motivated participants through the editing process. For the whole afternoon, our participants corrected, expanded, linked, and translated Wikipedia pages for women scientists. In total, in this wiki-edit-a thon session, 28 pages on women scientists were edited, leading to more than 5,000 words added to Wikipedia. These pages have been viewed more than 9,000 times already (as of December 4, 2018; up-to-date numbers here), showing the real-world impact of Wikipedia edit-a-thons. We thank CAVEAT NYC for always supporting science in an inclusive and fun way, and all the participants who contributed to increasing the visibility of women on the internet – one Wikipedia page at a time. *Statistics based on Wikimedia Foundation Wikipedia editor surveys 2011 (Nov. 2010-April 2011) and November 2011. Archived 5 June 2016 at the Wayback Machine. Laura García Ibáñez, PhD is a postdoctoral researcher at Columbia University Medical Center. Her studies focus on the mechanisms that give origin to B cell lymphomas. She also collaborates with the Association of Spanish Researchers in the USA and has been selected to be a part of the Fourth Homeward Bound cohort. Homeward Bound is a global leadership initiative to empower 1000 women working in STEM to become leaders in their fields. As a member of this program, Laura will be traveling to Antarctica in November 2019. A passionate advocate for science, Laura is most concerned about the spread of anti-science policies and sentiments, such as the anti-vaccine movement. In her free time, she loves the outdoors, traveling, and dancing.